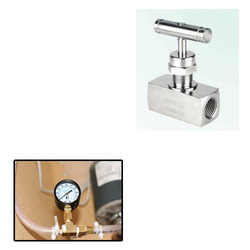 We feel proud to introduce ourselves as one of the well-known manufacturers, exporters, suppliers, importers, wholesalers and traders of Needle Valve for Pressure Gauge. The offered needle valve is designed in the shape of needle. Our supplied needle valve consists of a threaded plunger and small port. The exported needle valve is acclaimed for precise regulation of fluid flow in the pipelines. Our wholesaled needle valve is made from hard wearing metallic alloy. Looking for Needle Valve for Pressure Gauge ?